In an under-caffeinated state yesterday morning, I picked up the NYT Travel section to see where I might escape once my teaching is over in a few weeks. 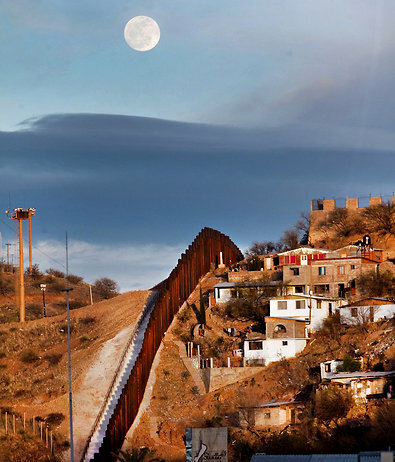 Nogales, Mexico, seemed easy to get to – you just go to Nogales, Arizona, and walk across the border. Good for tacos and cheap dental work. A few hours and several coffees later, I settled down to read Why Nations Fail, Daron Acemoglu and Jim Robinson’s new book. It summarizes their many years of research (some with Simon Johnson) on political and economic institutions and their impact on economic growth. The book has no equations, graphs or tables and is aimed at a popular audience. The book begins by comparing the colonial history of Mexico and the U.S.
Mexico was settled by Spanish conquistadores who extracted as much gold and silver as possible and used the population as slave labor. The British tried to take the same approach when they arrived in Virginia. But there was no gold or silver and the population density was low. They were forced to set up political institutions that fostered economic activity. Settlers eventually got to keep a large slice of any surplus they generated and got the right to vote on taxation (this led to trouble for the British in the long run!). All very interesting and yet it seemed familiar. Eventually it dawned on me that a key Acemoglu and Robinson motivating example, used to show the importance of institutions, is Nogales Arizona vs Mexico. The geography is the same and yet the political institutions are quite different. And so are the economic outcomes. So, geography is not the major determinant of economic outcomes (roughly the theory of Jared Diamond) and political institutions are at the core of economic development. Serendipity, synchronicity, call it what you will, but the time seems ripe for this book. Acemoglu and Robinson have a blog to accompany their book. I suppose they will interpret comtemporary events through the lens of their theory. I look forward to reading it on a regular basis. Not having read the book, my comment may not be germane but the little paragraph you wrote reminds me strongly of Engerman and Sokoloff’s (1997, 2000) argument on the effects of initial factor endowments on institutional development. What do you think? The theory of Jared Diamond is that geography is a major determinant of economic outcomes until 1500, when Nogales Arizona and Mexico were at the same level, much behind Europe or Asia. Acemoglu et al. take it from there. If the Spanish (extractive) institutions were so bad, why do Dominican Republic, Cuba or Puerto Rico have greater GDP per capita than Jamaica (British) or Haiti (French), and much better measures in other indicators as health or schooling. Although institutions matters a lot, the example in the American case has many flaws… especially compared with Africa. How isn’t the institutions in Haiti and Jamaica not extractive? Both Haiti and Jamaica had slave based sugar cane economies. Exactly, it is not about British vs Spanish, it is about something else. The Spaniards arrive to central America but the British arrive (later) to North America. Haiti and Jamaica are the counter-example: had the British arrived to central america, things might even been worse there now (Africa is a good example too). Moreover, by 1800 Latinamerica was richer than North America, which contradicts A&R theory. It wasn’t until the collapse of the Spanish empire and the disorganized disintegration of it (civil wars and war between new states) that Latin America fell behind. So most likely it is not about extractive institutions, but about the consequences of war, and lack of trade. JOSE: A&R argument isn’t about British v Spanish. You’re correct that Latin America was richer than North America but that doesn’t contradict A&R’s argument, a better comparison would be a developing colony v developed colony. As you say the long run differences may be due to war and trade which is precisely A&R’s argument, extractive institutions (defined as institutions that give elites an monopoly on policy making which they inevitably use to extract rent from everyone else) in the short run leads to policies that extract rent to benefit elites eg slavery and trade restrictions, and in the long run political instability which may manifest into civil conflict/war, ie war/rent seeking policies is a fuction of type of institution. I don’t think this is Jared Diamond’s theory, but political geography has everything to do with the difference in the two Nogaleses. Not unrelated, is the fact that the single most common (determining?) circumstance of sustained national democracy is not wealth, not location, not population/ethnicity but former British colonization. This fact about British colonization is at best wrong and at worst misleading. You just have to look to Africa and realize that US, Canada and Australia are the exceptions, not the rule. The institutions of economic freedom (rule of law, property rights, democracy) became more advanced in the English sphere of influence in the 18th century, and as a result these nations outperformed the Spanish nations. Before then the differences were minor, which is why the natural resource endowments of Latin America gave it an early, albeit, unsustainable lead.